Edited to Add: Isabel Moore is our winner. Congrats Bella! I loved hearing all your suggestions for names for the pair of dachshunds. You guys are clever, clever. Bella voted to name the doxies “Rascal” and “Flatts”. Hehe! The actual names of the doggie babies are Theobold and Walter. Theo is the black one and Wally is the white one. 🙂 Love. It. This has been the best giveaway prompt! 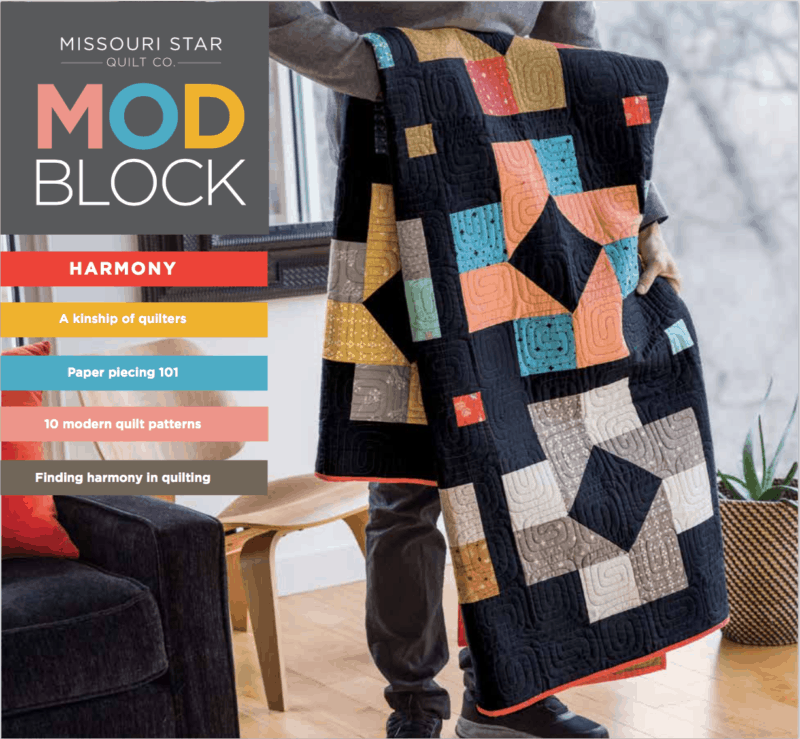 This issue of ModBlock is now available at Missouri Star Quilt Company. Exciting news! I’ve got a new quilt pattern in the latest issue of ModBlock, from Missouri Star Quilt Company. In the magazine you’ll find my quilt, Ancient Radiation, along with 9 other quilt patterns by the other fantabulous designers. Isn’t that cover quilt so cute? It’s by Amy Smart. 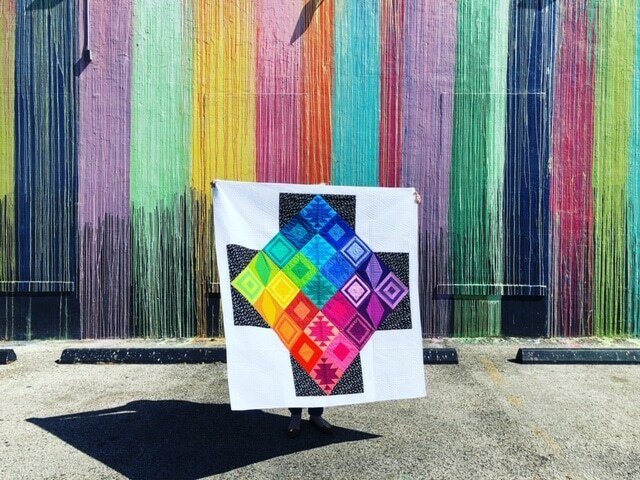 This is Ancient Radiation and it’s a lovely combination or two of my favorite things: rainbows and triangle quilts. 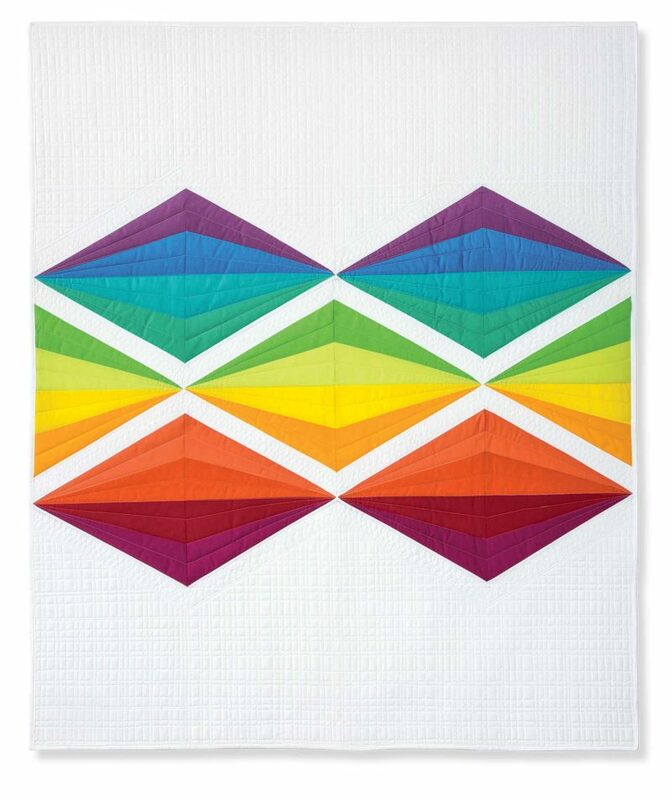 I could not resist making a new rainbow quilt for this issue of ModBlock, which has the theme “Harmony”. What’s more harmonious than a rainbow. With this rainbow, I tried to pair some bolder colors, Sangria, with some softer colors for an ethereal feel. All the colors are Kona cotton by Robert Kaufman. I completely love the pictures MSQCo took. They are fantastic. And the pictures throughout the rest of the magazine are equally as lovely. You can nearly feel the texture of all the fabric and quilts. Subscriber Bonus: If you subscribe to my newsletter then you know what’s coming. Yes! Subscribers, enter your email address here to get the free coloring and quilting planning sheet delivered directly to your inbox. Or you can find it on the Coloring Sheet page. You can use this sheet to plan your colors and also plan your quilting design. I find it so helpful to sketch my quilting design. Do you want to be a subscriber and access all the free extras? Click here to get started. I’ve got an extra Fat Quarter bundle of these Kona colors that I used to make the quilt. I’m giving away this Fat Quarter bundle of these Kona colors (these are the same colors I used in my quilt!). I’ll also throw in a copy of ModBlock. To enter the giveaway for the Ancient Radiation Rainbow fat quarter bundle, please leave 1 comment on this post. When you leave your first comment, please name those dachshunds. I’ll start, the one on the left is named Hamlette (she’s a girl), the one on the right is Pickle. What do you think their names are? I hope you play along! My followers, new and existing, get a second entry. If you are a follower please leave a second comment letting me know. For a third entry please share this post via Facebook or Instagram, etc. There are sharing buttons at the bottom of this post, but you can also repost my Facebook or Instagram posts. After sharing in some form, you are welcome to leave a 3rd comment. The giveaway is open for all. If you are an anonymous commenter, please leave an email address. The giveaway will close Monday, April 3rd and I’ll update this post with the winner, hopefully by the 5th. Thank you for the chance to win this great giveaway. The names would be Maxine and Milo. Love this Happy Quilt!! I think they are Maxine & Merlin . I think the dachshunds are beautiful and their names are Dixie and Smooch. Thanks for the chance to win! I get your newsletter and I follow you through Bloglovin! I follow on Feedly and subscribe to your newsletter. I love the rainbow colors. Names could be Maggie and Millie. I love the quilt. How about Comet and Cupid. I call them Daisy and Buster! I follow you here Bloglovin! Thank you. Thanks for the opportunity to win and my names are Tristan and Isolde. Thank you for the chance to win. I think their names should be Mustard and Indigo! I follow you by email. Thanks for the chance to win! I subscribe to the regular Block books but don’t see how to subscribe to Modblocks? I also don’t see the new issue online? 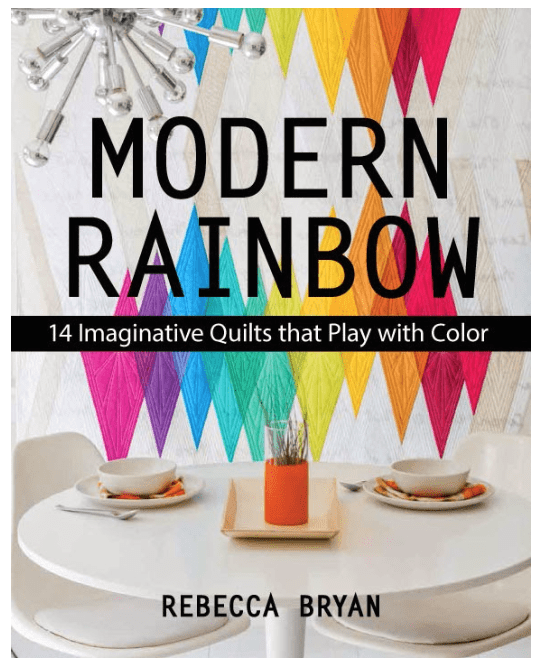 I want this book and the colors in your quilt are stunning. The names are Phineous and Ferb. I follow on Feedly ? So cute .. and I love, love, love the quilt. I would name the doggies Harry & Sally. Thanks for the chance to win! I’m going to say Pepper & Jax? That’s what they look like to me!! The dachshunds are named Ying and Yang. I follow you blog on Bloglovin. Love your happy quilt!! I am going with Bruno and Jarvis. What a beautiful rainbow! Love it and the photo looks like so much fun! I thing their names might be Romeo and Juliet! Thanks for the opportunity to win fabric. 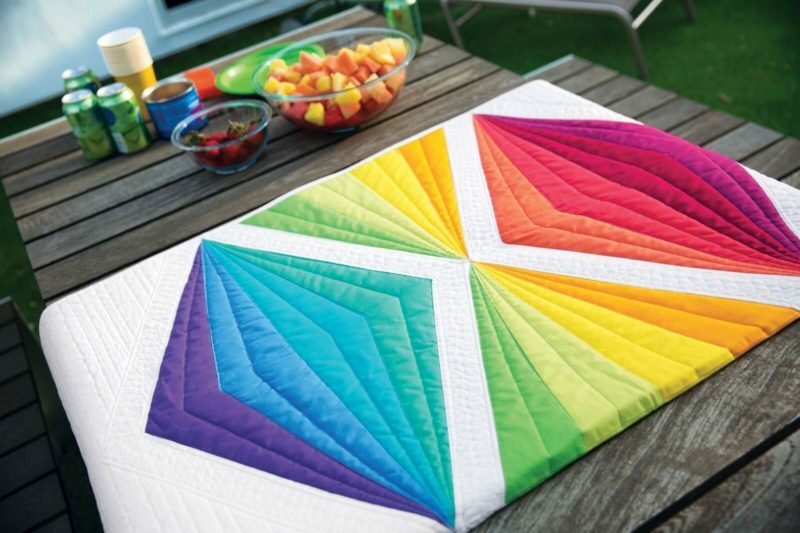 I’d love to win it so I can make this beautiful quilt and look forward to the pattern when Block arrives in my mailbox. i follow on blog lovin,. thanks for the giveaway. how ’bout mack and cheese for the doxies? Pretty quilt. Diamond and sparkle. How fatastic is that quilt?! So I’m thinking Otis on the left and Sandy on the right. So many fun names up there! I love the rainbow effect in your quilt. I think Juliet and Romeo. Hank & Marcy, and they are so cute! Willy & Frankie seem just right! Hmm. These dogs need fancy names. How about Diamond and Pearl? HAPPY TO FOLLOW YOU ON BLOG LOVIN’! How about Saucy + Pepper ! Very cute! Ancient Radiation is a beautiful quilt! The pups must be named Mutt and Jeff. Thanks! They are a couple of cuties! Apple and Pinto. Thanks! I follow on Bloglovin and get your newsletter. Ha! The dogs are so cute. Let’s call them Fred and Audrey. What a fun themed give away; and the best prize in all its yumminess ?. Of course they are Bridget and Pepper! And yes, I am a subscriber ☺️? I’m a follower and I love your quilt. Pups would be Annie and Hamilton (Hammie). I follow via Instagram (@makingwhatever). if their names are not ketchup and mustard, then they must be spotty and dottie! Those dachsunds crack me up. I’m naming them Hans and Liesel. Beautiful quilt as well! I follow you on Bloglovin’ and IG. What a gorgeous quilt. Perhaps they are called Ancient and Radiation? Naw, how about Radey and Ashun. I’d name the Cole and Taffy! Beautiful quilt! Love the colors. The doxies could be Strudel and Schnitzel. Succh a lovely quilt and wonderful colors! Names for the dogs could be Aura and Ion. 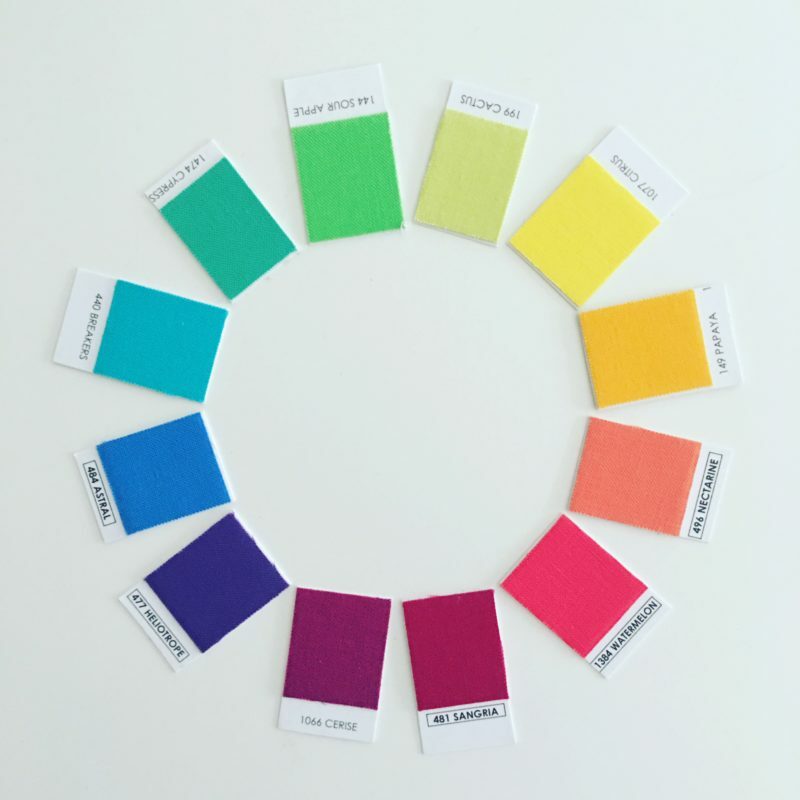 Great colors on the fabric bundle. I think Dogs name should be Buddha and Yoda. I think the names should be Sassy and Dutch! Love the quilt!!! Beautiful colors. Dot And Dash. Love the quilt. I would say Dudley and Penelope — as in the Dudley Do-Write and his love interest Penelope!!! I’m completely dating myself here — it was a cartoon in around the 70’s? Since I’m from Canada and Dudley is a Canadian Mountie! I follow your blog! I’d so love to win this to make this! Maybe shrink it down to a mini! Loved your class, at QuiltCon. My friends took the class also, we plan to work on our blocks this weekend. I follow you by your email newsletter! I am a follower . Love your quilt. And the names would be pea pod and beans. Wings and Beggar. Beautiful quilt and fabric choices! Love the quilt! I’m going with the names Randy and Dandy. The female is Dandy. I am subscribed to your email feed and follow you on IG. I nominate names aligning with Harmony…Melody and Rhapsody (Mel and Rap). Your quilt is beautiful. I am a subscriber of yours as well. Love your newsletters. Lets see…I think their names are Kiwi and Coconut…obviously I’m wishing I was someplace tropical! I’m a follower! I love your newsletter! How about Heather and Spot? I am a subscriber to your newsletter. Thank you. Thanks for the chance to win something from you! I took one of your classes at QuiltCon and thoroughly enjoyed it. Dogs should be named Pixie and Dixie. 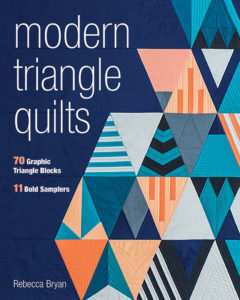 Love your triangles on the cover of your new book!! I subscribe to your newsletter! Thank you. I shared on Facebook! Thank you. 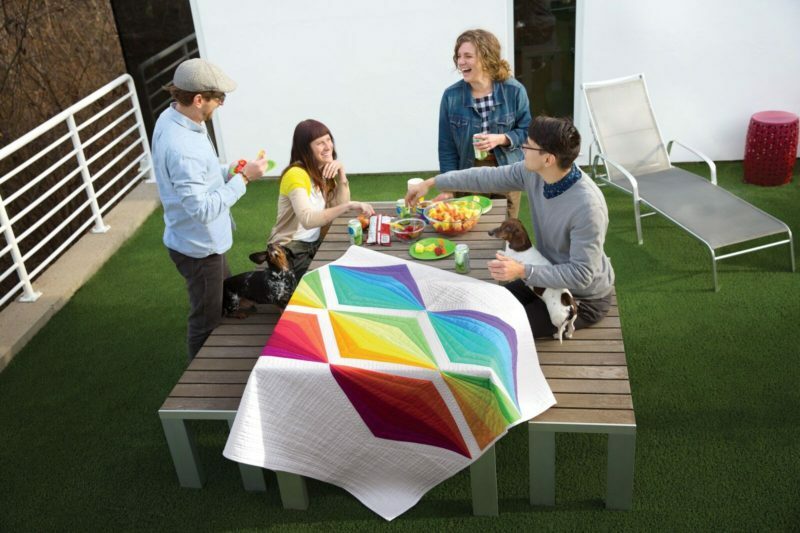 For a sec, I thought your new quilt was being used as a table runner–and I was horrified! You just can’t do that to a beauty like this 🙂 Thanks for the info about ModBlock–I never heard of it before. Thanks so much for a chance to win! I hear from you via email. Jamie and Martha for two famous foodies. I subscribe to your newsletter and follow on instagram and am very glad that I do. 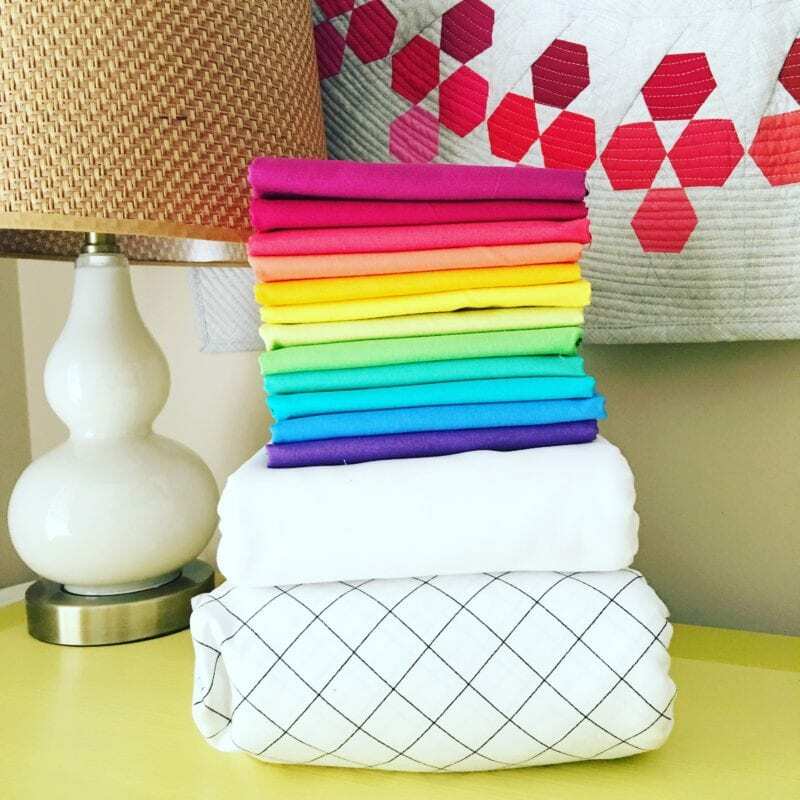 Love what you’ve created with Kona Cotton. As for the daschunds the one on the left is Speckled and the one on the right is Spotted. We can never have enough solid, speckled and spotted fabrics or dogs for that matter. In Harmony with Wanda and Rascal. They are so inquisitive and match the rainbow colours of the quilt. Thank you. Sangria. and Salsa . Obviously they both love a party . I’m a BHQ newsletter recipient. Bonnie and Clyde. Wow, that quilt is breathtaking! Name that dog! I think I shall call them…Professor Jeffery von Wagnsniff (left) and Pinto Bean (right) – Prof and Pinto for short. Thanks for the giveaway! Love your color selection. I would call the dogs Moxie and Doxie. Thanks! I think those adorable pups are Chuck and Mary. And if you knew my Chuck and Mary, well!….. I subscribe to your newsletter AND I just bought your first book Mordern Rainbows last weekend. It is SO yummy!!!! I just purchased your amazing triangle book! It is genius! I think the dog on the left is called Rascal and the one on the right is named Flats! Thanks for the chance to win! Also thanks for the great download of the Monthly calendar! 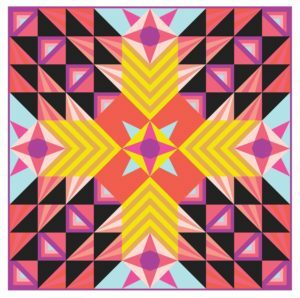 Love your quilt – beautiful colors and quilting. I’d name the dogs Porgy and Bess! I am an existing follower! I hope I win! I give the sweet dachshunds the names of Berry and Finn. Ancient Radiation is simply rainbow-ilicious! I receive your newsletter! Thanks so much! I get your newsletter, those dogs are so cute. They could be Fred and Ginger. I subscribe to your bog and I follow you on Bloglovin. You said the names of your dashund are Hamlette and Pickle. My dachshunds names are Joey and Harley. Thanks for the chance to win the beautiful bright fabric. I love the color pages, it releases my imagination to work outside my color box. .
Ive been your follower for a long long time and this is the first time Im leaving a reply! Gotta go with Lilo and Stitch although Samson & Delilah are a close second. hahaha I look forward to your newsletter and follow you on IG. Quilt inspiration is my daily dose of happiness – well that and stitching away! Am off to share on IG!